The following review takes a deep dive into glyphosate, the active ingredient in Monsanto’s Roundup®️ Weed Killer. We’ll look at the latest legal trial timelines, human exposure, agricultural use, the science behind the product, genetically modified crops, the fight over glyphosate, its cancer risk as a carcinogen, as well as the research behind the formulations. In 2014, California school groundskeeper Dewayne Johnson was diagnosed with terminal non-Hodgkin’s lymphoma. Although he has outlived the median life expectancy of someone with the disease, Johnson’s doctors do not expect him to live beyond past 2020. In Jan. 2016, Johnson alleged that his cancer was caused by prolonged use of and contact with Roundup Pro®️ and Ranger Pro®️ glyphosate-based herbicides, both products owned by agricultural biotechnology giant Monsanto. He sued Monsanto in the first ever lawsuit to go to trial alleging that glyphosate causes cancer. On Aug. 10, 2018, the jury announced its verdict and awarded Johnson $39 million in compensatory and $250 million in punitive damages. The potential risks of Roundup Pro®️ or Ranger Pro®️ presented a substantial danger to users. Monsanto knew or should reasonably have known that Roundup Pro®️ and Ranger Pro®️ were dangerous or were likely to be dangerous. Roundup Pro®️ or Ranger Pro®️ had potential risks that were known or knowable in light of the scientific knowledge that was generally accepted in the scientific community. Monsanto failed to adequately warn of the danger or instruct on the safe use of Roundup Pro®️ and Ranger Pro®️. Monsanto acted with malice or oppression. Monsanto responded, asking the judge, Suzanne R. Bolanos, to overrule the jury’s verdict. At first, Bolanos’ tentative ruling favored Monsanto, stating that Johnson “presented no clear and convincing evidence of malice or oppression to support an award of punitive damages”. On Oct. 22, 2018, Bolanos upheld the jury’s verdict. In her ruling, Bolanos wrote that, “the court does not sit as a replacement for the jury, but only as a check on arbitrary awards”. The ruling reduced Johnson’s punitive damages to $39 million, matching compensatory damages awarded by the jury. Johnson accepted the judge’s ruling, leaving him with around $78 million in total damages. But Bayer, which acquired Monsanto in June, is planning to appeal. Is Roundup®️ really a carcinogen? Let’s break down how we got to this point. Glyphosate, the active ingredient in Monsanto’s Roundup®️ weedkiller, is the most widely used herbicide in the world. First used for agriculture in the 1970s, glyphosate use has since exploded: two thirds of the total volume of glyphosate used in the U.S. in the last the 40 years (between 1974 to 2014) was sprayed in just the last 10 years. According to U.S. Census data, up to 2.5 million workers in the U.S. perform jobs that could require spraying or handling herbicides, including groundskeepers, agricultural inspectors, graders and sorters of agricultural products, and miscellaneous agricultural workers. Many of these workers likely to interact with glyphosate on a regular basis, though how many is unknown. But agricultural and maintenance workers aren’t the only ones using the weed killer. But agricultural and maintenance workers aren’t the only ones exposed. One study from the University of California San Diego School of Medicine shows that since genetically modified Roundup Ready®️ crops were introduced in the 1990s, use of the weed killer has grown 15x. The study analyzed the glyphosate levels in urine samples from 100 people living in Southern California from 1993 to 1996 and 2014 to 2016. In 2016, 70 percent of participants had detectable levels of glyphosate in their bodies. According to the National Pesticide Information Center (NPIC), the acceptable daily intake of glyphosate for humans is 1.0 mg/kg 一 More than double the levels detected in 2016. Indirect exposure to glyphosate in humans may come from eating food that came into contact with the herbicide. A study from the Canadian Food Inspection Agency found moderate levels in commercially grown food. It found trace amounts of glyphosate in almost 30 percent of 3,188 food samples. However, only 1.3 percent exceeded Canada’s maximum residue limits (MRL), meaning the vast majority of the food was still considered safe for human consumption. Another study from the Canadian Food Inspection Agency found more moderate levels in commercially grown food. It found trace amounts of glyphosate in almost 30 percent of 3,188 food samples. However, only 1.3 percent exceeded Canada’s maximum residue limits (MRL), meaning the vast majority of the food was still considered safe for human consumption. 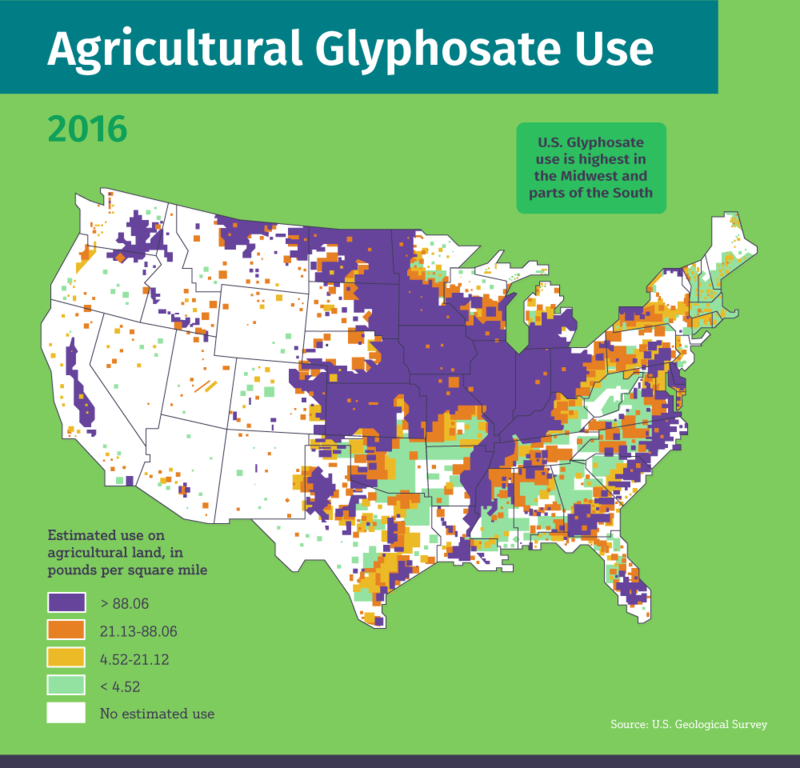 Agricultural use of glyphosate in the U.S. is highest in the Midwest and parts of the South, according to the U.S. Geological Survey. The crops with the highest glyphosate use are soybeans, corn, cotton, pasture crops and hay, and wheat. Millions of people in the United States alone come into contact with glyphosate in some form every day. Why do we use so much herbicide? Glyphosate is a systemic, non-selective herbicide. What does that mean? 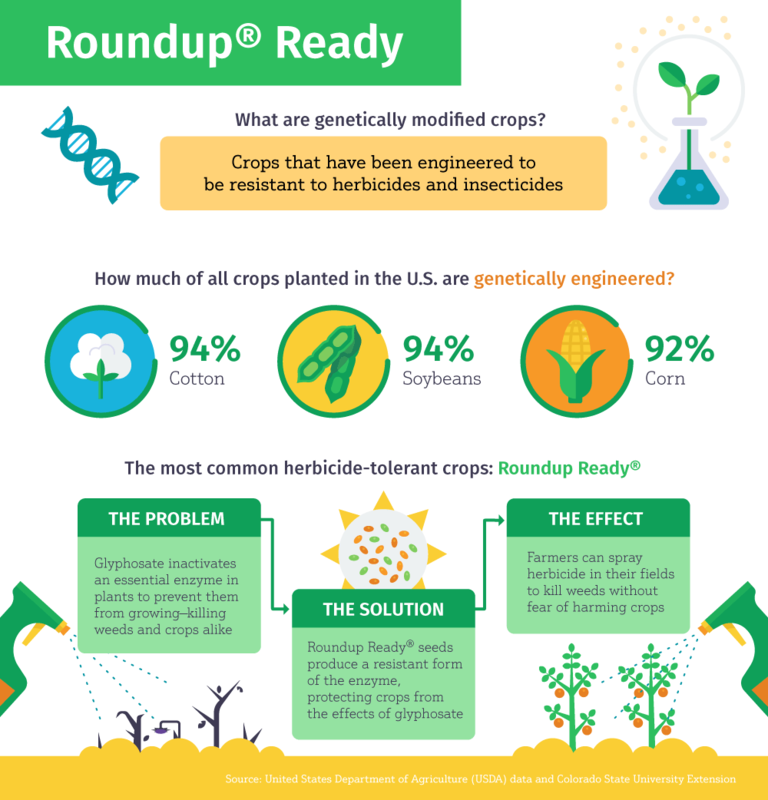 Herbicides such as glyphosate are most commonly used by farmers to eliminate weeds that would rob crops of nutrients, thereby increasing crop yields. They are also used by gardeners in private and public gardens to eliminate common weeds and by foresters and biologists to help maintain desirable plant cover or eradicate invasive species. If the U.S. agricultural industry was to go without herbicides, estimated crop losses would be valued in the billions. According to a 2003 study from the National Center for Food and Agricultural Policy, farmers would lose $21 billion annually. The loss of food and fiber crop production alone (including commercially grown food and cotton for clothes) would total $13.3 billion and 288.5 billion pounds of crops. A more recent study conducted between 2007 and 2013 by the Weed Science Society of America found that if weeds were allowed to grow uncontrolled just in corn and soybean fields in North America, yields would be cut by 50 percent, costing $43 billion in economic losses. Without these chemicals, farmers would struggle to compete in the marketplace and food shortages would increase. So the big question: Is glyphosate safe? Monsanto is one of the largest agrochemical and agricultural biotechnology companies in the world. In June 2018, St. Louis-based Monsanto was acquired by German-based pharmaceutical and life sciences giant Bayer AG for $66 billion. In 2017, Monsanto, now the Monsanto unit of Bayer AG, had net sales totalling $14.6 billion. Sales in its agricultural productivity segment, of which glyphosates reportedly make up a significant portion, totalled $3.7 billion, about 25 percent of total net sales. For years, environmental activists had been concerned about the effects of Monsanto’s Roundup®️ on human health, but little evidence of glyphosate being a human carcinogen emerged until March 2015, when the International Agency for Research on Cancer (IARC), an arm of the World Health Organization (WHO), published a new finding. 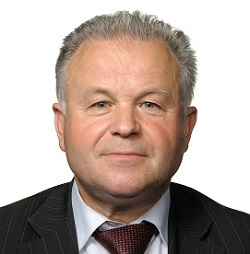 In its report, the IARC classified glyphosate as “Probably carcinogenic to humans.” This means there was “Limited evidence of carcinogenicity in humans” and “Sufficient evidence of carcinogenicity in experimental animals.” However, the IARC’s data was limited to agricultural workers, who showed increase risk of non-Hodgkin’s lymphoma after spraying the chemical. The effect in the media and in the agricultural industry was immediate. Supporters of the herbicide industry decried the report as biased, while environmental advocates touted it as a confirmation of what they had always suspected. In Jan. 2018, the IARC published a defense of its findings, addressing claims by some groups and media outlets that select sections of the report had been edited and some data deliberately excluded. The IARC claimed that most of these attacks had come from the agrochemical industry. 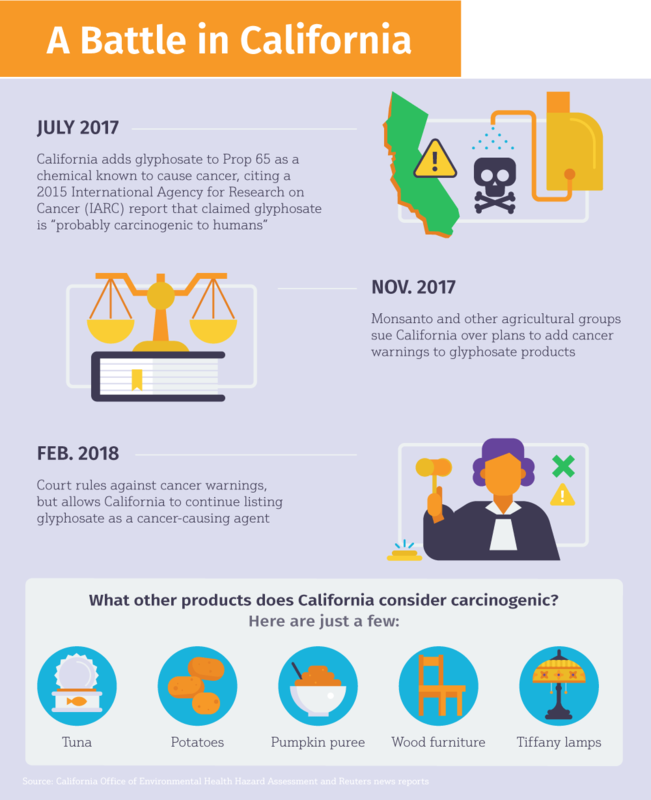 In July 2017, in response to the IARC’s findings, the state of California listed glyphosate as a chemical known to cause cancer, per the California Safe Drinking Water and Toxic Enforcement Act of 1986 (aka Prop 65), enforced by the Office of Environmental Health Hazard Assessment (OEHHA). The IARC’s study is the sole evidence upon which the listing is based. Since the IARC’s report, multiple national and international health agencies have reviewed the study or revisited their own research into whether or not glyphosate should be classified as a carcinogen. So far, the IARC’s 2015 study is the only published report claiming that glyphosate is likely carcinogenic. 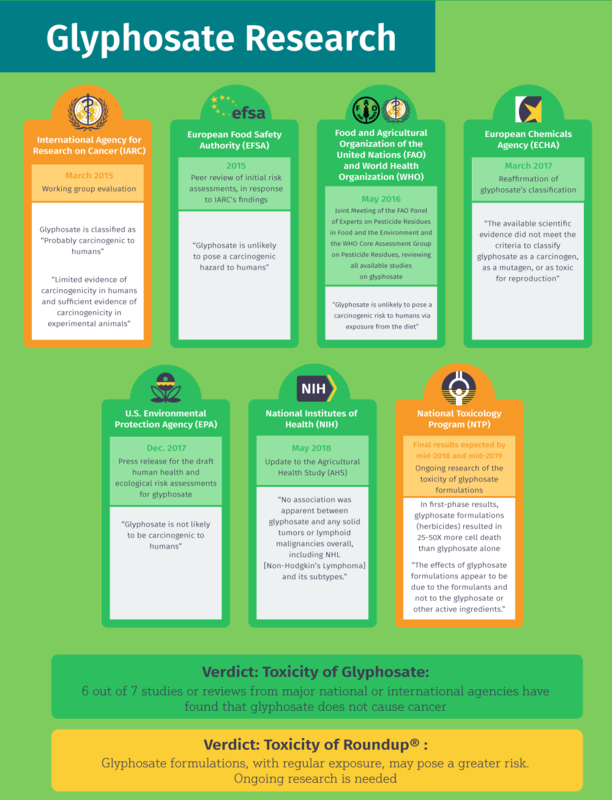 Six major national or international agencies have found glyphosate to be safe. Within the U.S., the Environmental Protection Agency (EPA) and National Institute of Health (NIH) have both reaffirmed their stances that glyphosate likely does not cause cancer in humans. In April 2018, the EPA closed a 60-day public comment period for its Draft Human Health and Ecological Risk Assessments for Glyphosate, claiming it would then evaluate those comments and consider any risk management options for glyphosate use. The resulting decisions are scheduled to be published in 2019. The other U.S. report, the Agricultural Health Study (AHS) conducted by the National Institutes of Health, is the largest ongoing prospective cohort study on the effects of pesticides on humans. Backed by the U.S. government, the AHS has surveyed thousands of U.S. agricultural workers since the 1990s to track trends in agricultural safety. The study has been updated with new findings every year. European and international health agencies have also weighed in. However, even if the research does not find glyphosate to be a carcinogenic, that does not mean Roundup®️ or other glyphosate formulations are safe. Most research so far has only tested the effects of glyphosate on its own一while the complex and often secret formulations sold to the public as herbicides have not been fully examined for toxicity. Ongoing research from the National Toxicology Program is attempting to change that. Its research examines the toxicity of both the glyphosate active ingredient alone and glyphosate formulations (commercial herbicides). In the first-phase results, glyphosate formulations were linked to 25-50X more cell death than glyphosate alone. This suggests that while glyphosate is safe for humans, formulations like Roundup®️ may be another story. 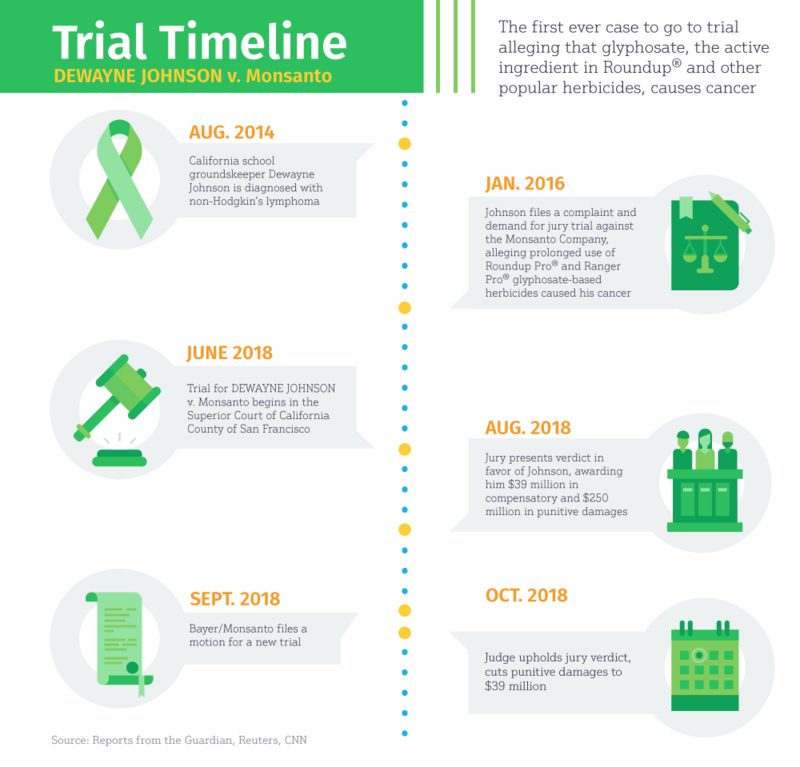 On Sept. 18, Bayer filed a post-trial motion asking the California Superior Court judge in San Francisco to set aside the jury’s verdict, reduce the reward to Johnson, or grant a new trial. Bayer’s Monsanto unit is reportedly facing an estimated 8,000 glyphosate lawsuits in U.S. state courts. Several cases are expected to reach trial by Feb. 2019. The debate over glyphosate is ongoing. 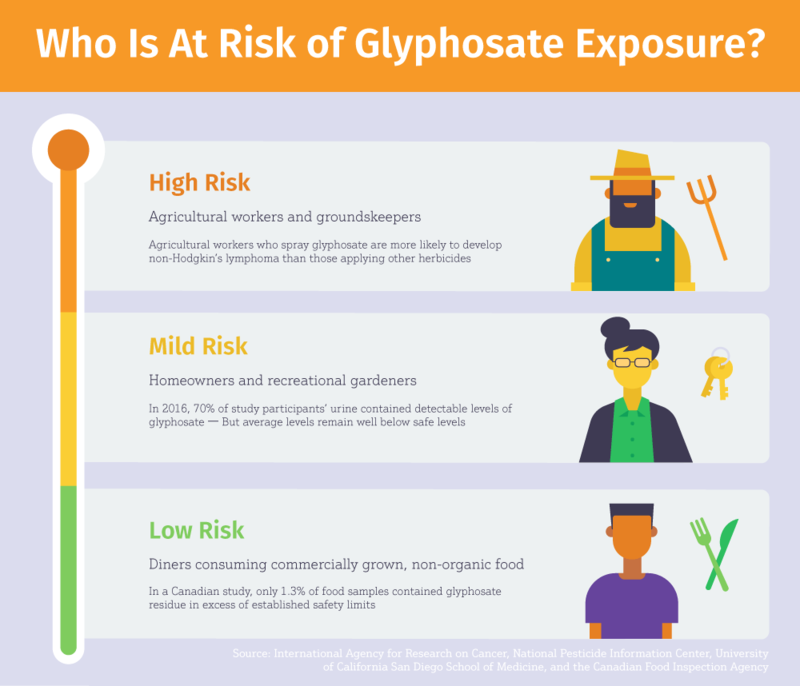 While most research seems to suggest trace amounts of glyphosate in food and other products will not harm consumers, more research is needed to understand the toxicity of Roundup and other glyphosate formulations. If you are one of the 2.5 million workers in the U.S. who have direct contact with herbicides on a daily basis, it may be best to err on the side of caution. The EPA’s Agricultural Worker Protection Standard (WPS) lists safety requirements for agricultural workers and pesticide handlers. For more information about how to protect yourself at work or ensure your workplace is meeting pesticide safety requirements, go to pesticideresources.org. DISCLAIMER: All product and company names are registered® trademarks of their respective holders. Use of them does not imply any affiliation with or endorsement by them. Want a Full Infographic Visual? The following infographic can be shared to tell the whole story of this presentation.